chocolatelikesnow: Finally...the First of the First Early Harvests! It's been a long time coming, but this weekend was a momentous occasion as it marked the first potato harvest of the year. I think this is the latest first early harvest ever for us. Why so late? For some reason the first early's this year did not flower. Our second earlies and maincrop potatoes flowered ages and ages ago, so we waited patiently for the flowers to appear but not a single one did. I would like to blame the weather, but all the other potato plants flowered, and they are much bigger, so I really don't know. Anyway, we took the plunge and dug a few Sharpes Express plants up, this was the yield from 3 plants. To be honest, I was really pleased as compared with all the other potatoes we have growing this year, these were the least impressive looking. I cooked them for 15-20 minutes and they were lovely :) Sometime over the next week or so we will have to dig up some of the other first early's we have growing this year (Pentland Javelin and Arran Pilot) and see if they have been as successful. The other varieties we are growing are Wilja and Kestrel (second early's), and Desiree and Pink Fir Apple (maincrop). I love Pink Fir Apple potatoes! This year we have stuck to "old favourite" varieties. 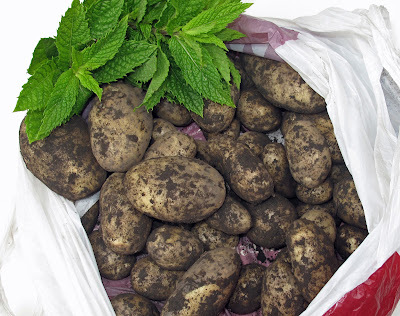 Last year I tried some of the heritage variety Mr Little's Yelthom Gypsy, they were really expensive to buy and I got barely enough potatoes for a meal for 2 from about 6 plants. I was really disappointed. Fresh mint to go with the potatoes. I also use the mint to make fresh mint tea in my Turkish teapot (çaydanlık). When I pick the mint I put it in a glass of water to keep it fresh for when I want to use it. 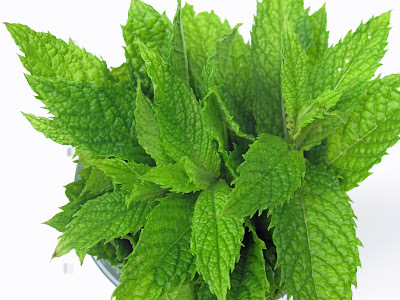 The normal advice for making mint tea is to add sugar or honey to sweeten it. I don't do this as it is sweet enough already! All you need to do is to put the mint leaves in water, bring it to the boil, and let it brew for 5 minutes or so. 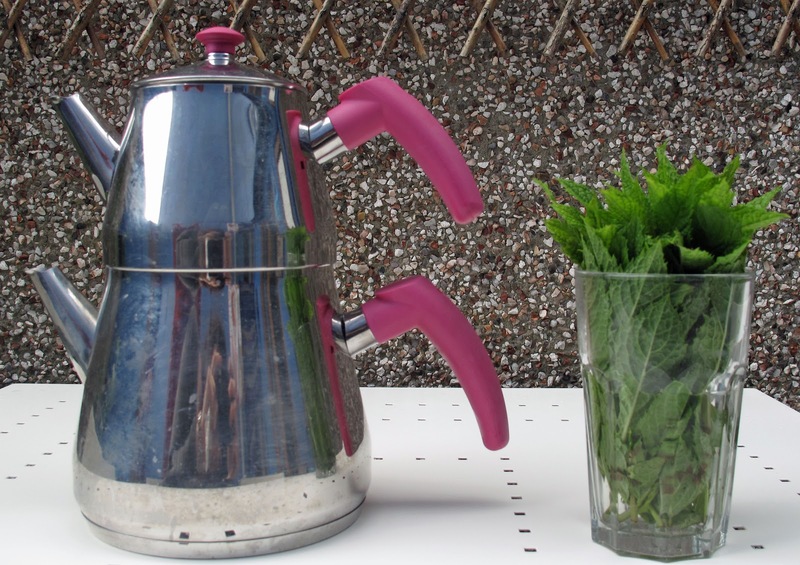 If you want you can also add a teabag (black or green) to the mix, but I don't do that either. Some potato varieties hardly ever flower. What has been noticeable this year has been the ones that do such as Desiree.